The United Grand Lodge of England issued the ‘Warrant of Constitution’ in the name of ‘The Riverside Lodge No: 4201’ on the 3rd November 1921. This indicated that the first meeting would take place at The Masonic Chambers, 9 Hamilton Street, Birkenhead. There was also a total of 43 guests who attended. I am sure that the farther founders would be pleased to see that we are still here performing well after all these years. The Installing Officer for the Master Designate, W.Bro. Matthew Hunter, was W.Bro. Herbert Channing Howell, P.Pr.G.W. The ‘Festive Board’ at that Consecration Evening must have been a splendid affair at a cost of 10 Shillings and 6 Pence (52p). Unfortunately, over the years the Menu for that evening has become lost. In 1921 the yearly Subscriptions were 2 Guineas (£2.10p) and were not increased until 1924 when they were raised by 1 Guinea to 3 Guineas (£3.15p). However, the Joining Fee and Initiation Fee was 15 Guineas (£15.75p). I have tried to put those Fees our Founders and early Initiates paid into prospective. In 1921 a P & O Cruise to Norway cost from £12.00, a complete Cottage type Suite with a Dresser cost £30.00. An average Simi-Detached house cost £600.00 and Petrol was 8p a gallon. The average skilled worker was earning £4.00 per week and the unskilled worker £2.50p. The State Retirement Pension was 25p per week whilst at the time a British European Airways pilot was only earning £450.00 per annum and a general cook £52.00 per annum. Can you imagine how many potential Initiates would have been put off from joining, if we asked them to pay pro-rata at today’s current yearly wage, as the average is about £12,000.00. In 1921 the average yearly wage, was in the region of £150.00. That would put the price of joining Masonry today at about £1,000.00 and that, which must have been a magnificent Consecration Meal at today’s equivalent of £72.20p. Riverside’s first meeting was at The Masonic Chambers at 9 Hamilton Street, Birkenhead. 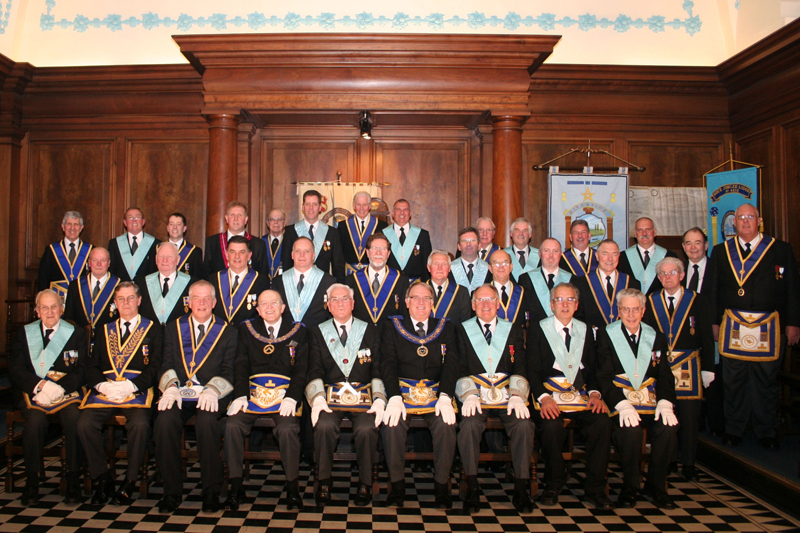 During those early months the Lodge had no shortage of Joining Members or Candidates. At the meeting held on the 21st April 1921, there were Ballots for 13 Joining Members and for 4 Initiates. Two of those Initiates became the first two Initiates into Riverside Lodge, Bro. Thomas Henry Myers and Bro. James McLeary. On the 20th October 1921, the Joining and Initiation Fees were increased to 18 Guineas (£18.40p), that pro-rata would have, today, put those Fees at £1,107.00p. Even this didn’t deter them, on the 10th November 1921 there were six more waiting to be Initiated and on the 7th November 1921 a further seven. There were so many wishing to join that most meetings had double First, Second or Third Degree Ceremonies. In fact at the Meeting held on the 16th June 1921, a double First, Second and Third Degree was conducted, the Lodge Opening at 5:45pm and Closing at 9:30pm. October 1923, saw the Lodge move to The Masonic Temple, Clifton Road, Birkenhead, which had not long been converted from a chapel. In the early days of the Lodge, Social Events were high on the agenda. On 19th July 1921, the Lodge went by ‘Char a-bang’ for a picnic at Chester and then onto Eccleston Ferry by steamer. On 25th February 1925, Bro. Joseph Taylor Hargrave held his ‘Ladies Night’ at the Masonic Hall, Clifton Road. On the evening a ‘Whist Drive’ and ‘Dinner Dance’ took place. A week later an article appeared in the Local Press, describing the evening and giving a detailed description of each of the Lady’s gowns. How the attitude of the Press have changed towards us. Nothing can be more pleasing to the Master of a Lodge, than to Initiate his own son, a ‘LEWIS’. Two worthy Past Masters in Riverside Lodge were able to Initiate their own sons. W.Bro. Thomas Myers, a Founder Member, was able to Initiate his son, Bro. Thomas Henry Myers, our very first Candidate, 21st April 1921 and W.Bro. William George Morey was able to Initiate his son, Brother Leslie George Morey on the 8th January 1944. Both Thomas Henry Myers and Leslie George Morey went on to become Masters of the Lodge themselves. W.Bro. Thomas Myers was also fortunate enough to see his son Installed in the ‘Chair’, before being called to the Grand Lodge above in 1933. W.Bro. William George Morey, unfortunately passed to the Grand Lodge above on the 4th February 1949 prior to his son attaining the ‘Chair’ in 1962. As a matter of interest, a letter was received in 1991 from a Leslie George Morey, tendering his resignation because he was living in Scotland. Later in our ‘History’ other worthy Past Masters were able to Initiate their sons. On the 16th January 1964, W.Bro. Edward Bell was invited, by the then Worship Master, to Initiate his son, Bro. Alan Edward Bell. Unfortunately both father and son resigned in 1972. To top everything in 1994, a Past Master, who attained the Rank of ‘Acting Junior Grand Warden’ of The Province of Cheshire, W.Bro. Stuart Hale, P.Pr.J.G.W., was fortunate enough to Initiate both his sons into this great Lodge. As can be seen from from the list of ‘Officers’ in 1996, W.Bro. Hale’s sons have progressed the ladder to attain the ‘Chairs’ of Senior and Junior Warden. A first for Riverside Lodge occurred in 1997, when Bro. Mark Hale Installed his ‘blood brother’, Stuart Stacey Hale into the ‘Chair’ of the Lodge. What a proud night that was for their father W.Bro. Stuart Hale. Since the 50th Anniversary, Riverside Lodge has undergone a great deal of change. The Lodge moved home on two occasions. The first, from the Masonic Temple, Clifton Road to the Masonic Temple, Oliver Street, Birkenhead, and then on the 11th November 1991 to Hulme Hall, Port Sunlight. Also since that 50th Anniversary, we have changed from the ‘Bothomly Magee’ workings to ‘Emulation’ Ritual and we thank those Brethren, in particular W.Bro. G. B. Webster and W.Bro. J. M. Brennan, who helped us through that transition. In the first 50 years we had many members of rank but since the Lodge has reached even higher honours. The first member of the Lodge to be honoured with Grand Rank was W.Bro. James Arthur Thomas Collins, who was appointed Past Assistant Grand Director of Ceremonies in 1988 and who also held the Office, at one time, of Provincial Grand Secretary of the Province of Cheshire. As well as his work in the Province, W.Bro. Collins continued to be a stalwart member of Riverside Lodge. In 1994 the Lodge was further honoured when W.Bro. Graham Bernard Webster was appointed to Grand Rank as Past Grand Standard Bearer, a truly magnificent achievement at the age of 48 years. One person who deserves the acclamation of the Lodge is W.Bro. John Langford Weigh (Jack as he is affectionately known). Jack Weigh was Initiated into Riverside Lodge on the 21st November 1929. He became Master in 1947 and has held every Office in the Lodge. On the 21st November 1989 he Celebrated 60 years in Masonry. What a memorable night that was, attended by the V.W. Joseph William Hawkes, the Deputy Provincial Grand Master who during the Celebrations promoted W.Bro. Jack to P.Pr.J.GW. Jack Weigh has been asked to become an Honorary Member of the Lodge but insists on paying his way. The R.W. Provincial Grand Master is of course no stranger to Riverside Lodge. In fact at our 50th Anniversary Meeting W.Bro. Rev. W. Stanley Walker was the Assistant Provincial Grand Master and on that occasion was presented by the Lodge a cheque for £500.00, for Charity. Charity has always been very close to the hearts of all Lodge Members, which following the tragedy at Hillsborough in 1989, when so many lives were lost at a football match, saw the Lodge make an immediate donation to the Hillsborough Fund from the collection plate at the Lodge Meeting together with money raised at as Raffle held during the ‘Festive Board’. 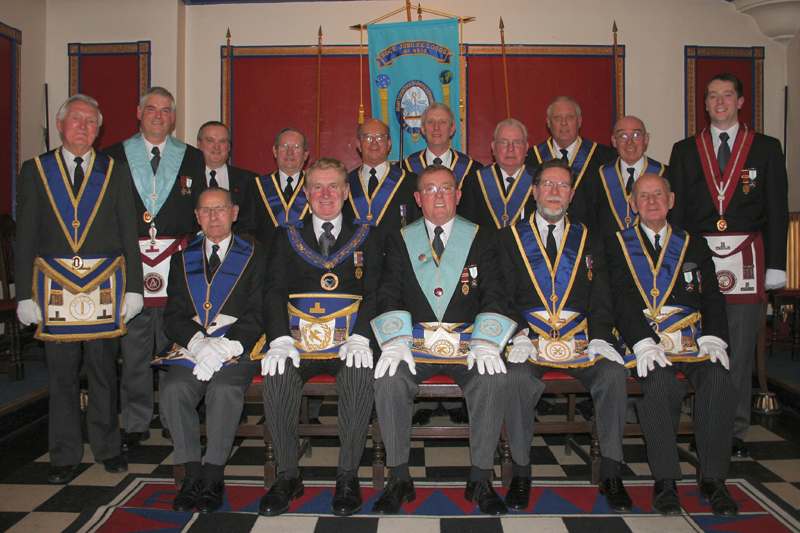 At the 75th Anniversary, the Lodge was very pleased that the R.W. Provincial Grand Master, The Rev. W. Stanley Walker, was able to attend as he had at the 50th. He was accompanied by the V.W. Deputy Provincial Grand Master, Peter Warren Wellings, the Worshipful Assistant Provincial Grand Master, Gordon Raymond Sheriff and the Provincial Director of Ceremonies, W.Bro. Keith Roberts, P.A.G.D.C., all of whom accepted Honorary Membership of the Lodge. On the 4th February 1996, Bro. Joe Croft was promoted to the Grand Lodge above. Bro. Joe was Initiated on the 17th January 1985 but as a founder crewman on the Royal Yacht ‘Britannia’ and with all the sea going duties that entailed, he wasn’t ‘Passed’ until the 16th April 1987 and then not ‘Raised’ until the 17th November 1988. Joe had the distinction of not only being the holder of The Royal Victoria Medal (awarded for service to the Royal Family) but in addition had a Bar to that Medal. In fact Joe spent 32 years on the Royal Yacht. The Lodge celebrated its 75th anniversary on 21st March 1996 at Hulme Hall Port Sunlight, Wirral. Present, were 28 Lodge members and 128 visitors. The WM at the time was W. Bro. Derek Hobbs. On the 16th January 1997 the Lodge decided to return to holding its meetings at Oliver Street, Birkenhead where it remains to this day. Since 2002 the Lodge sadly entered a period of decline due to falling attendance and declining membership. However on 17th March 2005 the Lodge was fortunate to celebrate the 50th anniversary in Masonry of W. Bro. A.R. (Ron) Jones, who was promoted to the rank of P.Pr.G.Supt.Wks, by the officiating officer, W. Bro. K.P. Roberts P.S.G.D. A.P.G.M. A splendid evening of pomp and ceremony. In December 2006 the Lodge decided to grasp the nettle and began to explore the possibilities of amalgamation. We entered into dialogue with several Lodges, notably Lilley Ellis No. 3236 and Rock Jubilee No.4310. In a very short period of time the three Lodges formed a bond of friendship and by January 2007 they agreed to amalgamate retaining the number of the oldest Lodge 3236 and adopting the name Phoenix Lodge. (Rising from the Ashes). But amidst all the doom and gloom a candidate emerged (proposed by our SW, Bro. Les Morris) and on 19th April 2007 the Lodge assisted by the Brethren of Lilley Ellis and Rock Jubilee Lodges welcomed Bro. Paul Grannon into Freemasonry. Bro. Paul will have the distinction of progressing through the initial stages of Masonry in three different Lodges culminating in Phoenix Lodge. Tribute must be paid to a number of people. To all the Secretaries of Riverside Lodge, who have kept our records in our Minute Books, as without their sterling efforts this History Report would not have been possible. To W.Bro. Clifford Crosthwaite, P.Pr.A.G.D.C., the Secretary and Organist for many years. To W.Bro. Albert Edward Blake, P.Pr.G.Supt.Wks., who recorded our Golden Jubilee. Also W.Bro. John Everest Punton, P.Pr.A.G.D.C., W.Bro. Neal Eaton, P.Pr.A.G.D.C. and W.Bro. Herbert D. Bruffell, P.Pr.J.G.D. who prepared a History for the 75th Anniversary.